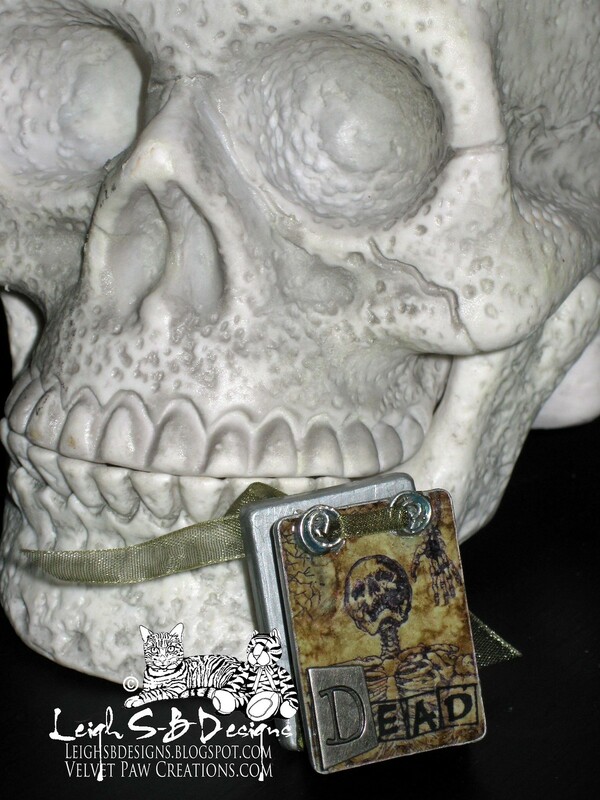 Velvet Paw Creations: Book of the Dead - Altered Game Art for the Dark & Twisty TCCC#7 Challenge! Book of the Dead - Altered Game Art for the Dark & Twisty TCCC#7 Challenge! I hope you're all enjoying the spooktacular altered game art eye candy being shared on my DominoART blog during our 31 Days of Halloween event plus the blog hopping going on for Smeared and Smudge's 31 Days of Halloween too! If this is the first time you're hearing all about it then hop on your broomsticks and dash on over to DominoART for all the gorey details! TCCC#7 Dark & Twisty - A Macabre Halloween! The challenge ends on Oct 24 at 7am! So if you've got some Third Coast Stamps that fit the theme then hurry in your challenge entry for a chance to win a $25 gift certificate! I had major surgery with some nasty complications on Oct 2 and its taken all my energy to keep up the posts on my DominoART blog's 31 Days of Halloween but I'm improving with each day and wanted to share this wicked cool project I made before my surgery! the sponsors of DominoART's 31 Days of Halloween grand prize! Grave Digger FA-494-K, Tree of Dread sm VB-054-C, Halloween Queen VB-299-P, Pumpkin Princess VB-300-J, Batty for Halloween VB-291-P, Spider Web AP-522. I used 2 Rummy tiles to make the cover for my book and drilled 2 holes into the top of each tile. Earthtones - Slate, Lights - Lake Mist, Mixative - Silver and Mixatives - Snow Cap. The sides and the 'fronts' of the tiles are coloured with a metallic silver Sharpie marker. The images were all stamped with Jet Black StazOn ink and the surface sealed with Judikins Diamond Glaze. The glaze actually changed the colour of the alcohol inks and made the brown hues appear! I made the spiral wire embellies from silver wire and adhered them over the holes on the front cover with a dab of Judikins Diamond Glaze and added the Making Memories metal Randsom Letter D too. I used Vellum Alphabet stickers by NRN Designs to form the rest of the word. View of the back with the olive green ribbon threaded through the book and tied in a bow on the back. The photos below show all the pages I made for my book. I used white cardstock and tore the paper to make the pages and coloured them with Distress Inks Peeled Paint and Black Soot. All the images were stamped with Tuxedo Black Memento Ink. I created a little pocket on each page and stapled the sides of each pocket with a tiny staple. Holes were punched through the top edge of each page with a pick tool. The pages are hung on silver jump rings and inserted between the Rummy covers and the ribbon threaded through the jump rings holds the pages inside the book. I plan to hand write spells on some tiny pieces of paper and/or tags and insert them into the page pockets to complete my project! 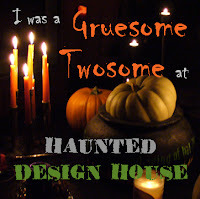 Thanks for visiting my blog today, now hop on your broomsticks and zoom on over to my Third Coast blog and enter the TCCC#7 Dark &Twisty challenge then back on over to DominoART to continue feasting your greedy eyes on the eye candy and blog hop your self silly with Smeared and Smudged! What a unique project! Thanks for joining us this week at the Simon Says Stamp challenge! Wow, Leigh!!! This is amazing!! Another project fit for a queen....The Domino Queen indeed!!! very cool, the whole domino thing is new to me, I really love the colours and cover image. makes me want to give one a go. Your little book is simply AMAZING! Beautiful job. Thanx for sharing and for the inspiration! Wow! This is super cool! I would totally wear this as a pendant. Very, very cool and inspiring. Wow! Great job! Thanks for joining us at My Sheri Crafts! Oooh lovin this little book you created. Awesome job love it. This is stunning and beautiful. I love the domino books and yours is elegant dark and rich. Thank you for joining us at poisoned peas please. Hi Leigh - I've not seen a little book like this before and you've done a stunning job on this. Thanks for sharing your project at Lexi's Creations this time in our "Halloween" challenge. your artwork is always stunning Leigh, absolutely fantastic! !